Pictured above is the new tinyTILE development and production platform featuring the Intel Curie module. This board is a miniature version of the Arduino 101 and measures in at just 35 x 26mm (1.38 x 1.02 inches), and has been designed to fit on prototyping breadboards. The tinyTILE board can be programmed using either the Arduino IDE or Intel’s own software – the Intel Curie Open Developer Kit (ODK), and the I/O connections are functionally identical to those on the Arduino 101. With its small size, low-power consumption, array of motion sensors (6-axis sensor with accelerometer and gyroscope), and Bluetooth Low Energy (BLE), tinyTILE should be ideal for battery powered wearable devices and any other IoT projects involving motion monitoring. 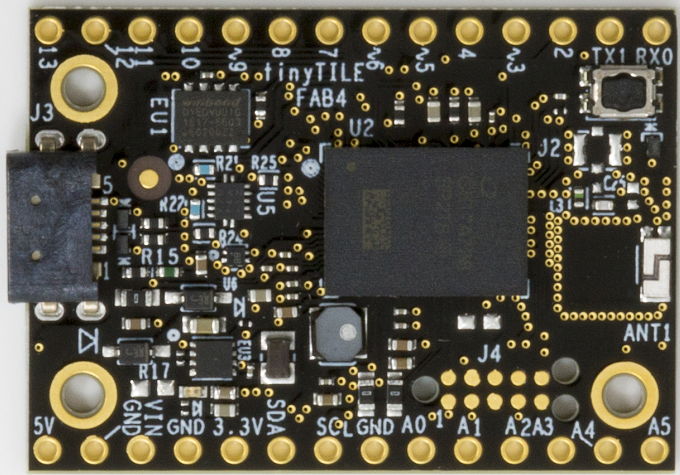 tinyTILE has a 32-bit 32 MHz Intel Quark SoC, 384 kB flash memory, and 80 kB SRAM. It also includes a digital signal processor (DSP) offering quick pattern matching identification of actions and motions. tinyTile can be USB powered via its micro-USB connector. The board has its own internal 3.3V regulator and 3.3V (but 5V tolerant) I/0 connections. tinyTILE is available now from element14.com (US+) and cpc.farnell.com (UK) amongst others.